Searching for the best deals and discounts on web hosting this Black Friday? Here are the top Black Friday web hosting deals which will help you get up to 98% OFF on your favourite hosting products. Are you searching for best black Friday web hosting deals? If yes, this post is exclusively for you where I’ll be sharing few of the incredible black Friday hosting deals and coupons for 2019 to get web hosting at an unbelievable price. Black Friday is America’s BIGGEST annual holiday shopping frenzy that attracts a lot of sales each and every year. Black Friday is on November 23rd in 2019 and if you are searching to grab the best web hosting deals at the cheapest cost, don’t miss out this Black Friday. Here are my top picks of best Black Friday web hosting deals and discounts for 2019. 14. SEMrush (Best Deal) 14 Days of FREE SEMrush Pro Worth $47. Quick note: This page has a compilation of mostly the best black Friday hosting deals. Apart from that, you’ll also discover few of the best SEO tools related deals. Let’s first start with the best hosting deals you can avail this black Friday, 2019. Here’s a list of some of the best black Friday hosting deals you can avail in 2019. Black Friday Promo starts on 23rd November and continues until 26th November, 2019. So for 3 full days SiteGround have 75% off on their shared hosting. On top of the standard features like free domain names, 24/7 technical support, 99.9% uptime, etc. Whenever I share something about web hosting deals on my blog, there’s a reason why I always suggest Bluehost in the first place. And the reason is that, I’ve been using the same web hosting service on my websites for a very long time and I never got any hosting issues whatsoever. That’s the reason why Bluehost is one of the most popular web hosting services in terms of both web hosting and security. It also has anytime money back guarantee so you can ask for your money refund anytime if you are not satisfied with Bluehost hosting or services. 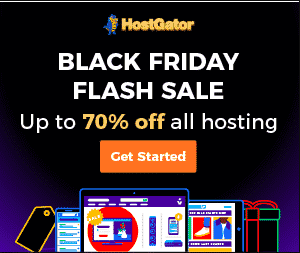 HostGator Black Friday 2019 Flash Sales Timing: Each of these flash sales will only last ONE HOUR. All day access: From 1:00 am to 11:59 pm CST: Coupon code: 2019BF (to get all day access but you’ll get up to 65% discount with $5.99 select domains. All day access: From 1:00 am to 11:59 pm CST: Coupon code: 2019SB (to get all day access but you’ll get up to 65% discount with $5.99 select domains. What happens if you miss HostGator Black Friday/Cyber Monday flash sale 2019? Thursday From 1:00 am to 11:59 pm CST. Coupon code: 2019BF (to get all day access but you’ll get up to 65% discount with $5.99 select domains. Friday From 1:00 am to 11:59 pm CST. Coupon code: 2019BF (to get all day access but you’ll get up to 65% discount with $5.99 select domains. Special small business sale From 1:00 am to 11:59 pm CST. Coupon code: 2019SB (to get all day access but you’ll get up to 65% discount with $5.99 select domains. Cyber Monday From 1:00 am to 11:59 pm CST. Coupon code: 2019CM (to get all day access but you’ll get up to 65% discount with $5.99 select domains. If you are searching for a monthly based web hosting plan, undoubtedly HostGator is for you. Not only HostGator stands out from the crowd by offering monthly hosting services, but it also has 3 various plans to attract various users namely Hatchling, Baby and Business plans. HostGator is currently hosting over 9 million websites, so you can just imagine the popularity of this hosting service. It’s a very budget hosting service if you want to get a reliable and secured hosting service. HostPapa is a 100% Green eco-friendly web hosting company with its origin in Canada. Green hosting simply means it’s environmental friendly where it uses green technologies to reduce environmental impact. HostPapa has quickly become popular as most affordable, feature rich and low-cost web hosting choice for small to medium sized businesses and bloggers. Host Papa offers various hosting solutions including Shared web hosting, WordPress optimized hosting, VPS hosting, reseller hosting and so on. Here are few quick reasons to pick HostPapa during this black Friday week. Shared hosting is offered only $1/month if you’re buying a package of 36 months. Optimized WordPress hosting is offered only $1/month if you’re buying a package of 36 months. Just click on the button below to get HostPapa hosting at just $1 per month during this Black Friday (the deal will be applied for automatically, so you don’t need to enter any special promo codes). The HostPapa black Friday deal for 2019 will remain live from 23rd Nov to 27th Nov. So what are you still waiting for? Go grab the deal using the below link. WPX hosting is the hosting we use here at Bloggers Passion. This is not only the best managed WordPress hosting out there, it is the fastest and most secure too. With WPX hosting you get FREE migration, FREE SSL (which is a ranking factor) and best customer service. WPX hosting is offering huge benefits for first time customers this Black Friday, they are currently offering their first month at 95% HUGE discount on all of their hosting plans and then reverts to the usual price thereafter. Not only that, WPX hosting is also offering 3 months for FREE on annual subscriptions across all hosting plans so make sure to grab the deal during Nov 22nd to Nov 30th, 2019 to get these amazing deals. Above all, you’ll also be getting CDN for FREE with every plan from WPX hosting during this Black Friday. Did we forget to say that, WPX hosting offers FREE site migrations for up to 5 websites along with 99.95% uptime guarantee and super fast customer support? WP engine hosting Black Friday deals bring you a killer 35% off its pricing for new users. You can access it through this link and then using the coupon code cyberwpe2018. Using this coupon on annual plans will equate to 5 1/2 months free hosting! This is the biggest discount they have ever offered! If you’re looking to buy a a new domain or hosting, Namecheap, one of the world’s best domain sellers is offering huge Black Friday/Cyber Monday deals & discounts on new domain registrations, new hosting activation and SSL purchases. That being said, if you’re searching for the best black Friday domain deals, you must grab Namecheap domains in 2019 to get huge discounts. Now is the correct time to grab your year full of domains and hosting because they are offering up to 98% discount of their already low prices. The deal will remain live from 23rd Nov to 26th Nov! So, start with buying a new domain, hosting package or SSL for your business sites all for as low as $3. Use this link to get it or click the button below. A2 Hosting is known for two things: turbo speed which offers 20x better performance when compared to other hosting services and also for anytime money back guarantee which is very rare in the hosting industry. So what are you still waiting for? Go grab the black Friday deal from A2 hosting now! Important: A2 hosting black Friday sale will start on November 21st and it will continue till November 27th, so if you want to get 67% discount on A2 hosting, use it during that time by clicking the link below. iPage is another favorite WordPress hosting of many users. They provide great features and they are affordable at best. iPage hosting is perfectly okay for beginner bloggers and website owners and also the ones that handle large sites. This flexibility makes it a killer deal. With the iPage hosting Black Friday deals, you can avail the best rated hosting with minimum investment. iPage is offering huge discount that saves you FLAT 75% OFF along with free goodies like Google Adwords coupon and Bing ads coupons. You also get free malware scans to prevent your sites from getting crashed or hacked. If you want maximum black Friday discount coupon of iPage hosting, here is the link to get them fast where you can save FLAT 75% discount. These are the maximum discount that you’ll ever get on the web so grab them now by clicking on the button below. Ever want to host your site on a high performance and 2x faster WordPress optimized hosting platform? Hosting is a great choice for you then. So what are you still waiting for? Go grab the Hostinger Black Friday hosting deal using the below link to get a massive discount of 90% on their shared hosting plans. If you’re in a search for the best cloud based hosting sites, you probably have heard about Cloudways and during this black Friday week, they are offering an outstanding discount of 30% off on all of their hosting plans. Here are few benefits of using Cloudways hosting. Here are the details of Cloudways black Friday hosting deals for 2019. Here’s the list of some of the best black Friday deals around SEO tools. Did you know that when I asked over 40 SEO experts about their favorite SEO tool, among 18 of them recommended SEMrush. It’s one of the incredible SEO tools out there to crush your competitors. Click here to find out the most unbiased review of SEMrush before giving it a try. SEMrush is offering you a $119 worth Traffic Think Tank SEO forum access (1 month for free). If you’re wondering, it’s the #1 private SEO slack community where you can discover some of the amazing SEO tactics to take your website to the next level. Apart from the above, they are also offering 14 days of free SEMrush PRO (worth $47) OR 14 days of FREE SEMrush GURU (worth $99). The third offer is, if you happen to buy a full one year of SEMrush, you pay only for 10 months, that is 2 months of FREE usage. Here is the link to this offer. You can avail only one of the offers, though. These deals are no less than the regular SEMrush black Friday deals they offer so grab them and stay benefited. A big Long Tail Pro Black Friday weekend sale is up for you. From November 23rd – 26th 2019, Long Tail Pro will be 50% off, making the price just $18.50/month (Normally $37/month). Here are the various pricing plans discounts. You will NEVER get LongTailPro for just $18.50 EVER again. If you are a SEO lover like me, you know the importance of using long tail keywords. Long tail keywords not only drive massive organic traffic to your web pages, but they are highly potential in converting normal visitors into customers. When it comes to finding long tail keywords, nothing comes closer to Long Tail Pro keyword research tool. Long Tail Pro normally sells for $37/m, but from November 23rd – 26th you will get it for only $18.50/m. You’ll be saving 50% money! Quick note: Long Tail Pro is also offering 2 new features including SERP analysis and competitor keyword research during this black Friday deal at no extra cost. Here are few of the best premium WordPress black Friday deals. Elegant themes are one of the most popular themes around. This time in Black Friday deals, they are giving a whooping 25% off and offering 1000s of other goodies like design layout packs, WP caldera which is great for designers. If you want to get a professional WP theme for your blog, this is the right choice and deal because you get access to all of their themes and plugins which include monarch plugin. Bumper offer for existing customers: Elegant themes is offering instant 50% discount on all of their themes for their existing customers. Use the following link to avail the offer. Template Monster is the king of website templates which is used literally by millions of people worldwide. During this black Friday, they are offering 50% discount on all their products. If you’re wondering what type of sites in various categories you can create using TemplateMonster, here’s a list of some of them. If you observe the above list, you can literally create a website on any category or industry you want ranging from medical to cars to food using templates from TemplateMonster. So don’t wait much as the deal will be active only from 19th Nov to 29th Nov, 2019. Click on the below link to get 50% off. Envira Gallery is a great choice for WordPress users to create mobile responsive and easy to use galleries. You don’t even need any technical skills to be able to create beautiful looking galleries when you’ve access to Enivra. During this Black Friday week which is from Nov 20th to November 30th, Envira is offering you 30% HUGE discount. Quick note: You need to enter BFSS30 in the coupon or promo code to save 30% on Envira gallery. So what are you looking for? Go grab the black Friday deal from Envira gallery to save 30% discount now. Here are few newly added black Friday deals that have miscellaneous offers. If you’re someone like me, you would mostly prefer faster loading websites. But here’s the thing: making your site faster isn’t so easy. Here’s where you need top performance caching plugins like WP Rocket. WP Rocket is the performance boost which is also one of the widely used premium caching plugins which is used by professionals and experts allover the world to power their WordPress sites. During this Black Friday, WP Rocket is offering a whooping discount of 35% on all of their plans. Quick note: This promotion from WP Rocket will run from November 20 to November 27th. So what are you still waiting for? Go grab the deal from the below link. I’ve listed out only the hosting services that are top notch in customer support, uptime and security. Undoubtedly Bluehost, HostGator, WP Engine and SiteGround are one of the few great web hosting companies out there that are giving affordable web hosting services to their customers. They all are incredibly competitive and trying to get as many as customers possible by giving outstanding offers this Black Friday. So if you have been searching for the right time to buy a hosting service for your WordPress websites, this is the time. You will NEVER get hosting plans for such a low price, so don’t miss out this offer on Black Friday. Make sure to choose one among the above web hosts that suit your blogging needs. What are your thoughts? Are you going to use the best black Friday web hosting deals and discounts this time? Do you recommend any other hosting services to include in this list? Please share your views in the comments. All deals of Black Friday and Cyber Monday are amazing. I Purchased Shared hosting deals. Thank you so much for providing the valid coupons of Blue host. Thank you so much for this article – because of you I learned about WPX Hosting and will move all my sites to them! Great article! I might be do some awesome shopping from your recommended deal.Thanks for sharing. I just read your article at Donna Merrill’s space, so I came by to read from your blog as well. Black Friday is already here, and many, many are gearing up to make discounted purchases, and in fact, I’m one of them. You did amazing well in putting these Black Friday discounts together. I must say it’s a win win strategy as it will enable your readers make discounted purchases as well as keep your site engaged and increase profits. Many will be setting up new blogs, which makes it essential for web hosting discounts. grate deal thanks for sharing. Black Friday is the time to get awesome hosting deals and discounts. Very nice post of Black Friday and Cyber Monday. Thanks, Anil for a detailed post. HostGator deals are certainly unmissable. that’s a great deal ,I am gone take it .. I am so looking forward to Black Friday. I personally don’t pick up too many products during the year because I always wait until Black Friday. I’m such a huge fan of saving money on my business expenses. I’ve bookmarked this post so I can come back during the sale dates and pick up some of these tools to help me grow my blog. Susan, I also wait for Cyber week to purchase products of my interest as this is the time when I can save maximum money on my purchases. Can I still buy things till now. Nzekwe, you may not get huge discount around this time for most of products. If you want to buy hosting, can go for Bluehost which will cost you $2.95/month (Similar kind of price you will see around Black Friday) only if you happen to buy it for 3 years in advance. Is this coupon code still working? I want to buy hosting service from Bluehost. Right now you can get Bluehost hosting for $2.95/month using the link shared in this post. 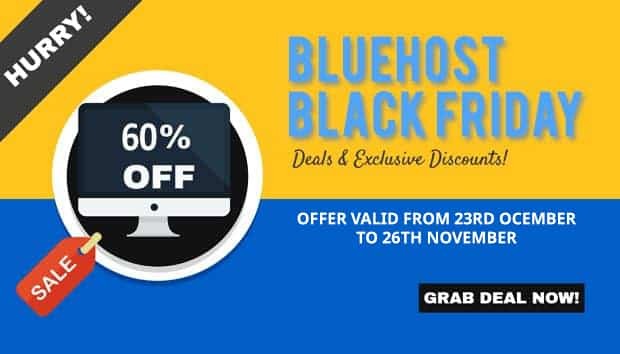 If you are interested in getting cheaper hosting from Bluehost, you have to wait till this Black Friday offer which will happening on 23rd Nov 2018. Thanks for sharing these best hosting deal details. I was searching for best black Friday web hosting deals and discounts but i was not able to find the proper details but now I found the complete details of best black Friday web hosting deals and discounts in this article. You have cleared my all the confusion . Thanks for sharing . Bluehost is awesome but they don’t have deals for existing customers. Unfortunately. We are looking to cut our bill so we might be forced to move. Black Friday may be the best time. Or are there bigger deals on Cyber Monday? There are very few companies (WPX I know of) that are offering exclusive deals for existing customers as well. Deal mostly will be same from all web hosts during Black Friday & Cyber Monday week. So you can claim them any point of time during Cyber week. Black friday and cyber monday. which day offer better discounts? Mahbuber, You can expect most of deals to be active for a week (Cyber week) from 21st Nov to 27th Nov (Black Friday is on 23rd Nov this time and Cyber Monday is on 26th Nov). Thanks anil for notify us for this black friday deals. you shared lots of coupons with us for best deals. What a fantastic blog you have Sir. We are just starting out in the field of blogging and seeing such a fantastic blog as yours, gives us both so much inspiration. We hope you can be so kind as to help us on our blogging journey. Thank you Anil for this post. Its really great to read about black Friday web hosting deals and discounts. Wow this Best Black Friday Web Hosting Deals & Discounts for 2018 is perfect for us..thank you for this article. Don’t forget to visit this page again around 20th Nov as that will be time when we will have exclusive deals around web hosting, SEO, WordPress themes & plugins. Really a Best chance for those bloggers who want to buy best hosting in low budget….